Nutrivo R1 Protein is a protein supplement based on the highest quality hydrolysate (WPH) and isolate (WPI) of whey protein. Isolate and hydrolysate are premium-class protein fractions, used only in the highest-quality products. Contrary to classic concentrate they are characterized by faster absorption time and lower level of undesired additional ingredients. Usually they are also better-tolerated by people with a sensitive digestive system. Everyone who strives for achieving slim body with a minimal level of adipose tissue should pay attention to the balance of macroelements in a diet. In order not to make your life harder, it is worth choosing a supplement, containing a maximal amount of protein with the lowest proportion of other elements. Lack of sugar and fat in connection to exceptionally high percentage contribution of protein in this supplement considerably facilitates keeping proper amounts of macroelements under control in our daily balance. By taking a portion of the supplement, we don’t need to reduce the amount of carbohydrate and fat products, as it happens in the case of other similar supplements with higher content of these macronutrients. Unfortunately, a diet of sportsmen is usually considered to be monotonous and very restrictive. However, it doesn’t have to be true, as thanks to protein supplements we may enrich the tastes of our diet in the most desirable and simultaneously deficient sweet tastes. Because of the high needs of sportsmen for proteins, they need to eat every day large amounts of meat, fish, eggs or curd. In order to protect yourself from losing appetite for these products, it is worth replacing a portion of meat with a portion of protein powder from time to time or use it as a component of meals, for example pancakes, omelets or dietary muffins. Protein supplements may also be used to prepare high-protein ice creams or sweet, thick glaze for desserts. It is worth having a portion of protein powder close at hand not only to supplement your diet in protein, but also as the last resort in the case of uncontrollable appetite for sweets. Preparing a delicious, creamy cocktail in such a crisis situation may protect us from eating the whole bar of chocolate or a cup of ice cream without any negative influence on our silhouette. As widely known, sugar is one of the factors that definitely are not conducive to maintaining low level of adipose tissue. Its content in a diet should be minimized not only because of the visual aspects of our body, but also due to health. Protein is a macronutrient which is much more thermogenic that carbohydrates and fats. It means that is requires using up much more calories already at the state of digestion, which may deepen caloric deficit, which is crucial to start utilizing energy supplies stored in fatty tissue. Excessive intake of refined sugar is connected to the increased risk of cell resistance to insulin and finally diabetes type II, developing tooth decay and intestinal microbiome disorders, especially the development of Candida yeasts. You will not find any fillers or thickeners in the composition of this product. In the era of highly processed food, it is decidedly worth paying attention to the composition of the products that we eat. The excess of synthetic supplementary ingredients, which in theory are supposed to improve general qualities of the final product may potentially influence health. Although these ingredients have been admitted to trading on a regular market, we actually don’t know their real influence on health, as we don’t have enough information regarding its influence on, for example, the state of intestinal bacteria, including the work of the immune system, the state of glycemic balance and our daily well-being. 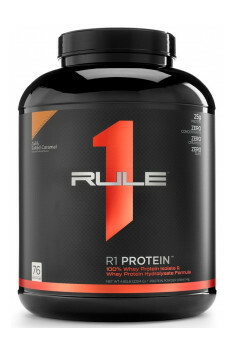 R1 Protein is recommended to sportsmen who want to supplement their diet in protein and who at the same time cherish only the highest quality. It will work well especially in the period of adipose tissue reduction because of the lack of sugar and fat as well as its sweet taste which is especially desired during following dietary restrictions. 1 scoop (28.9 g) mix in 250-300 ml of water. Consume 1-2 times a day, depending on demand. The product should be dosed according to individual protein requirements. An individual willing to increase muscle mass or keep it on reducing diets should increase protein intake. It can be assumed that the daily amount of protein in the diet of athletes and physically active individuals should be 1.5-2.2 g/kg of body weight. If you do not meet your requirements for this nutrient from diet, you can take it in the form of shakes in an amount corresponding to your protein demand. It is worth having a serving after waking up, just after a workout or at bedtime. Proper supplementation will help to achieve results quickly.